I think we were slightly mad when we decided to drive overnight in my Fiat 500X (there are other cars available 😉 such as a Honda etc. obvs) to the South of France rather than jump on a plane. But, I loved the romantic idea of having the four of us hauled up together, using the car to sleep in, breastfeed in, eat in and change nappies in! It was certainly a trip to remember, but it did come with a few challenges along the way. When we embarked on our journey, Indi was about 5 months old, so she was still exclusively breastfed. If you’ve read my post about our breastfeeding journey, you’ll learn that she was a snacker, so we had to stop LOTS of times along the way! Even on the hard shoulder of many French toll roads, which probably wasn’t very legal. This obviously slowed us down, and if we were formula feeding, we probably could have saved some time by one of us feeding her in the back whilst the other was driving. It’s an experience that needed some careful planning, some great boot space, and a reliable car, but it’s so great to be able to just take off whenever you want. The number one reason that otherwise happy and healthy children get cranky and irritable is hunger. Raisins, fruit bars and breadsticks are healthy snacks your kids can wash down with juice as you speed towards the Dordogne. You can take food over the water, so pack your car full, and it means that you won’t have to stop as much. Singalong tapes, audio books and family games (such as seeing who can tell a story about characters beginning with the letter ‘b’) will help the hours to fly by. Get your kids looking out for landmarks – the white cliffs of Dover, the sea, windmills, you name it! – and turn this into a fun game. If possible, try and all take a toilet break together, as this will reduce the total number of interruptions to your journey. I know, easier said than done with small children, but maybe a little easier with bigger ones. Are your kids’ squabbles getting a little too much? Play a game called: ‘whoever speaks first, loses’. Or, offer a reward such as a small chocolate bar, or a promise of more holiday spending money in exchange for half an hour’s precious silence from older children. Favourite toys, soft blankets to curl up in and a good quality car seat for younger children will work wonders in terms of reducing their tendency to become restless and irritable. We took a couple of feather pillows to prop tired bodies on during the nightime hours. 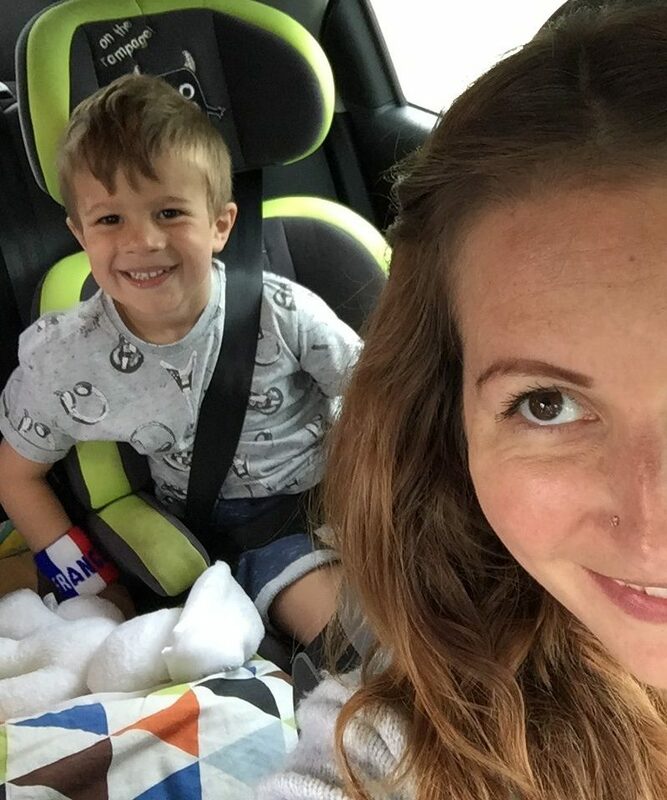 Before you leave, spend a couple of occasions telling your children how much you love travelling in the car, and recall some wonderfully exciting car journeys you took in the past (you may have to embellish a few details here!). This will help them to see the journey as a positive adventure rather than an arduous chore. Do your kids squabble if shut up together in an enclosed space for too long? Consider placing a physical barrier such as a bank of pillows or a piece of board between them if they are sitting beside each other in the back seat to stop them from pinching, poking and hitting each other, or generally getting on each other’s nerves. If you still think it would all be too much, try splitting the journey in half and spending one night in a hotel at a mid point such as Paris or Normandy. Travelling long distances with your children in the back seat can actually be positively pleasurable, and a great way to spend some quality time together. As long as you have a reliable car, such as a Honda Civic that would house your family and luggage easily, and you can afford the tolls (they are quite expensive, so take a cash card that will work abroad – maybe give your bank a heads up) and petrol, you’re all set! I would certainly drive abroad again, and it beats hanging around the uncomfortable airport, and dealing with plane tantrums!